We got off to a little bit of a late start Saturday. By the time we got downtown, LC had let us know not to bother with the 5 block long line at the Rachel Ray show. We took our time and enjoyed a lunch at the Brick Oven and headed over to the Mohawk Hot Freaks Showcase. Boy were we glad we did. KD, SB, RB, and I picked the right place at the right time (again!). I got frisky with the door guy and finagled a crazy extra amount of extra free drink tickets. Yum. JC showed up and met us, and some of KD’s friends. 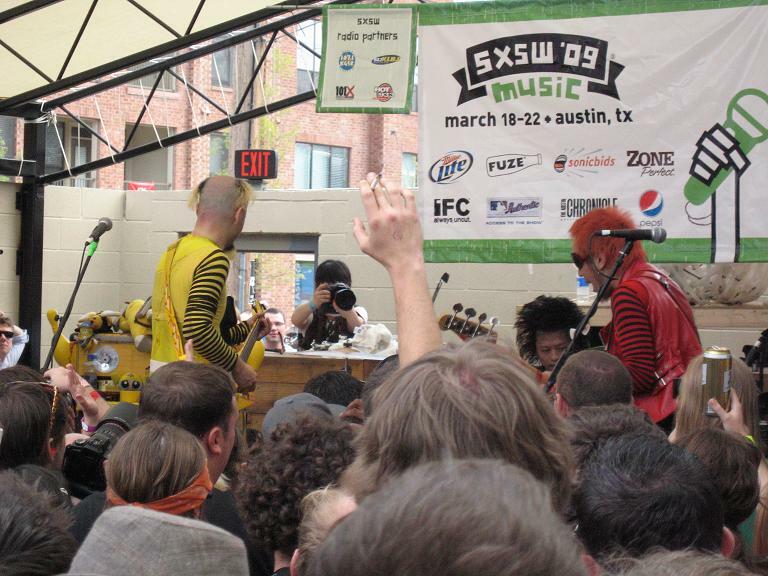 We saw the Vivian Girls, Viva Voce, Camera Obscura, and Peelander-Z. Peelander-Zis the band you see three hundred pictures of. Maybe it was the 50 PBR’s, but their show was pretty hilarious. JP and JC suggested that we go see the Gay Blades, a band that had played the Midgetmenshowcase Wednesday that I sadly missed. So we headed over to the Jackalope after joining up with DW. It was there I met my sister in law for the first time. Super exciting! We got along so well we didn’t even notice some band had canceled and there was no music. Oh well! The afternoon was a blast – my favorite kind of let’s all just go with the flow day. The Gay Blades music and showmanship was great and I was excited to be running around town in the great weather. Click here for the ton of Saturday day show photos. This entry was posted in Austin, Texas, Music, Photos, SXSW. Bookmark the permalink.